I had a little rust repair done on the GT back in the fall and was talking to the bodyshop owner- they had a Toyota Yaris that had been sideswiped (and not totalled, somehow) that had its rear quarter panel off, showing the subframe. The owner grabbed the rear shoulder belt upper mounting tab and flexed it back and forth a good inch and a half with ease. So either that's Toyota's version of the belt de-tensioner, or those cars are wet spaghetti in a serious crash. Scary. What is the rate of 'incidents' per mile driven of 928s and other models/types of cars. This is a question not about the car per se, it's more about the drivers. Most of us will say that we are better drivers than most but on average, do we also more frequently put ourselves at risk more often by the very nature of the car we chose to purchase and drive? An auto insurance company would have the answer to this question. After all, they base their rates for cars and drivers on statistical evidence. Ponderous at the very least. Anyone in the insurance industry care to research and share any data? Some cars are just built to pass the crash test requirements, while others are built from ground up with maximum safety in mind. As an aside, once the car came to a rest and I looked over to check she was OK, my daughter told me that her door wouldn't open (side impact damage). I told her to unbuckle and crawl out my side. She said, "but my shoes, daddy!) Sweet thing was still trying to keep the car nice and not put the bottom of her shoes on the upholstery! She's a keeper! No thank you - I've seen what happens when a SMART crashes into some huge vehicle...........like a Honda Accord or Mercedes C-Class. Not pretty. That was a bad one, I took that picture about 5 years ago. I thought it must have been a concrete bridge pillar. The car came from Queensland Australia. Don't forget to put a guy on the hood. Just in case some may not be aware, there is some safety upgrades we can do to our cars. I will seriously be looking at this when my car gets its carbon work, I hope this year. WRC have made it a requirement to fit closed foam cell door liners. These are said to greatly cushion the impact. The other upgrade is to line the door skin with carbon fibre. Again this greatly increases the strength of the doors. P.S if you want a pic of the foam, let me know. Local friend got hit by a 18 wheeler in his Mini Cooper. 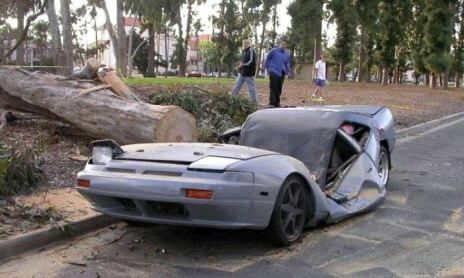 He and his wife walked away unscathed. Bought another mini the next day. Break-Ins in my Area, Marin County!